The Plague came, and good grief I wish the last little lingering fight it has would just leave. Alex came down with something about three weeks ago: fever, nasty cough, “thwoat huwts!”, constantly running nose. He seemed to recover pretty well, only to come down with another something nasty yesterday. I don’t actually know the answer to that. It’s possible it was Swine Flu, and it’s possible it was just a flu, and it’s also possible it was just a nasty, nasty, cold that then turned into a sinus infection. (And oh my god sinus infections are awful! This was my first, and it’s still hanging around, though it’s not causing me any pain at this point. Phew!) Regardless, Alex was fine after that illness, and I’m fine. And chances are if you catch it, you’ll be fine. But here’s the thing: The flu kills people. Every year. Especially babies, young children, the elderly and anyone who has other conditions that put them in a compromised health status. And this current flu? Is hurting otherwise perfectly healthy individuals. While it may not hurt you, it does hurt others. So if you are telling yourself, “I don’t need to get vaccinated against the flu. I probably won’t get it, and if I do it’s not a big deal!” you are right…kind of. But the thing about immunizations that most people seem to not understand: it’s not only about you. It’s about protecting others. The more people that don’t get the flu, the more people won’t die from it. By preventing yourself (and your family) from getting it, you are also preventing the people you come in contact with from getting it. By immunizing yourself, you are protecting people who are unable to get vaccinated and who could become deathly ill. You are protecting the people who, for whatever reason, the immunization did not work on. It’s not only about you, it’s about others. If you have the ability to get vaccinated, you should do it. Or at least think about what not getting vaccinated means: it means you may get sick, which means you may have to take time off of work, pay for medicine, find someone to watch your kids while you are struggling with a fever; it means you will probably get someone else in your life sick; it means you may carry around the illness and give it to someone who couldn’t be protected from it and could end up in the hospital because of it. Yes, I am pro-vaccine. Absolutely, unapologetically, pro-vaccine. It is a choice that each person must make for themselves, and I would neither force a vaccine on someone nor judge them harshly for choosing not to get a vaccine. But this year, with this flu, we are going to see a lot of people die. More than the seasonal flu, and more “healthy” people than usual. Earlier this week, there were multiple people in the ICU (at the hospital I work in) with the H1N1 flu, one of whom was 6 months pregnant and in a coma. 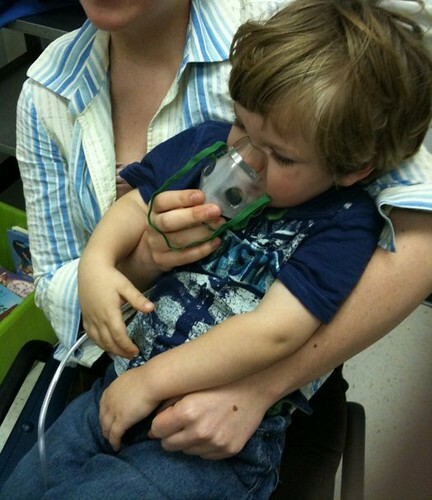 Yesterday, we took Alex to the pediatrician because he was having trouble breathing. The night before, he had a runny nose and a cough. In the morning, he was still coughing, and it’s possible he had a slight fever. By the time he woke up from his nap at daycare, he was wheezing, using his whole body to take in shallow breaths, and was in clear distress. He’s an otherwise healthy kid, but whatever he managed to catch in the last few days? Made him unable to breath. It’s possible it wasn’t a flu, but if it was something that could have been prevented? Well…a sigh is all I have for that. I hope Alex is ok! I agree about getting the vaccine. I can’t find the H1N1 one. Any ideas? Our ped isn’t doing it. Wow, that picture would change anyone’s mind. As far as H1N1 goes, my ped doesn’t have it yet. Additionally, I think it’s run its course in our house. I’ll ask more when we visit the ped for Flora’s 5yo check up next week. Dan and I had a long talk about vaccines when we started having children. Flu and H1N1 aside (they are special cases), I was pro vaccines. He was leery — he works with so many developmentally challenged kids. We compromised on a much less aggressive schedule. It meant more visits to the doctor’s office, but it brought a lot of peace of mind. Great post. It’s especially powerful coming from someone in the trenches (as a nursing student as well as a mom). I’m glad you guys are on your way to being healthy. Poor Alex. I had breathing treatments a lot as a kid (yay Asthma!) I just remember how bad it sucked to have to take them. I hate to see your little one with a breathing mask. Ugh. We’re really trying to get the whole family vaccinated against H1N1, but that’s hard to do! I’m considering going out to a Walgreens in New Ken because they might have it. I know some people our age who got swine flu and got hit really hard by it. Healthy, athletic, in shape adults- really really sick for days. Scary. I hope Alex recovers quickly! Goodness! I’m really behind on my reading so I’m just seeing this now. So sorry you guys were all so sick. I want to get us all the H1N1 vaccine but none of our doctors have it yet. grrr I’m hoping we can hold out & stay healthy until they get it! We came down with the Swine Flu right after Jonathan had had his nasal vaccine. I know they say it is rare to get it from the nasal vaccine..or from a person who has had it actually, but I think I did when I wiped Jonathan’s nose as it ran from his sinuses that day. It was awful…aches, pains, high fever and a cough that right now seems to have gone into bronchitis. The scary thing is how fast it moves. . . one moment fine…two hours later fever, chills, and coughing. Jonathan got it, but mild. I wonder if he might have got it worse had he not been vaccinated. Yes, it takes two weeks for it to take effect and he had caught something in the mean time…but again…could it have been worse? I hope Alex gets better soon. It’s scary…so scary.